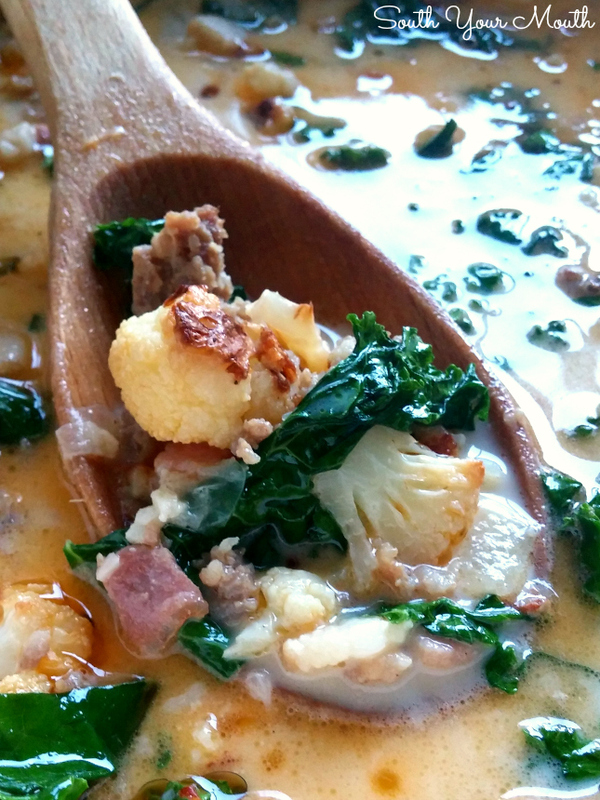 South Your Mouth: Zuppa Toscana with Roasted Cauliflower - Low Carb! 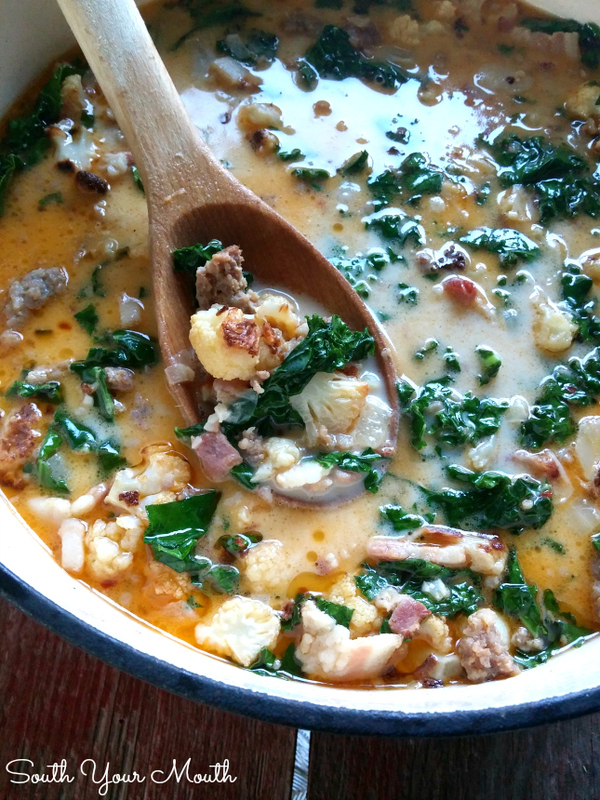 Zuppa Toscana with Roasted Cauliflower - Low Carb! 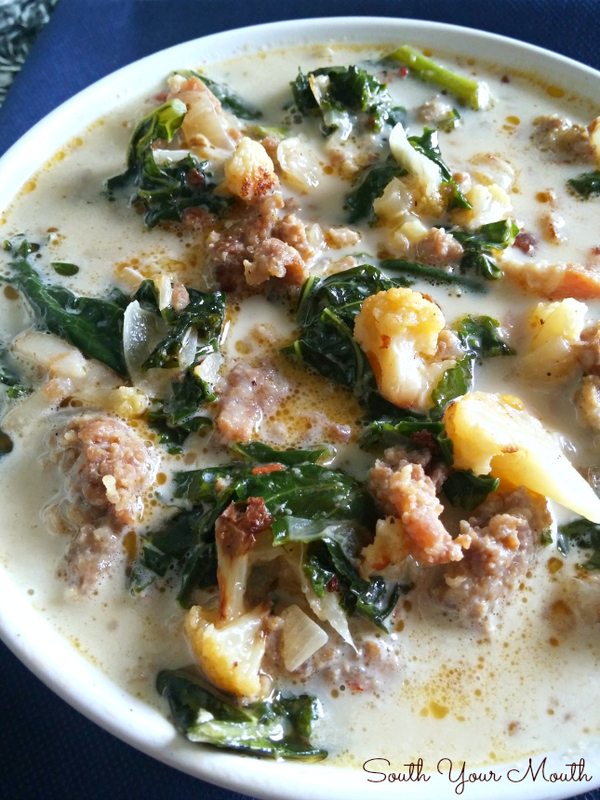 Low Carb Zuppa Toscana made with roasted cauliflower instead of potatoes. This soup has ALL the flavor of the Olive Garden hit recipe! So, I made this last Sunday just to have something to pack for lunch during the week. I wasn’t going to post it to the blog. I was just doing my weekend cooking. Knowing my buddy Christy Jordan (of the iconic - yes I said iconic - recipe blog Southern Plate) was on the low-carb wagon with me, I snapped a few pics of the soup and sent one to her. Then she told me I HAD to post this to the blog. And I told her I didn’t cook it for the blog so I didn’t put any effort into the photos or making it look pretty. Then she told me I had to or she would hurt me! HA! Y’all think Christy is this sweet little Alabama cherub in an apron but Christy is straight-up gangsta. Just kidding! Not really. Then we had a whole conversation about how much we HATE food photography. About how it causes us so much anxiety which is the opposite of how we feel when we’re cooking. She and I are kindred spirits in that regard. Put us in the kitchen and let us do what we do and all is right in the world. Bring out that camera and expect us to transform into a lighting tech - slash - food stylist - slash - professional photographer and try to capture the magic we just created and you’ll get our pressure up. Our preshah! But anyway, she talked me into it. Mostly because I’m so sick of eating the same ol’, same ol’ low carb foods and this soup was such a welcome change I HAD to share it with the world! Sorry about the pics. I did nothing to even try to jazz these up since I figured Christy would be the only one seeing them. All I had were the ones in the pot then I decided to try to get a shot of the leftovers in a bowl on my lunchbreak at work. Behold a bowl of leftover soup taken on top of an industrial document shredder in the conference room (closest I could get to a window). Note my lovely sweater on the bottom and the linen bag my purse came in under the bowl. I am SO professional! On both counts! Ha! OK, about the soup! Now that I’ve subbed roasted cauliflower for potatoes in a soup like this, I can’t wait to do it in a ton of other recipes! I roasted it first for a few reasons. One, I wanted to draw out some of the moisture. I also wanted the cauliflower to keep its shape in the soup and not cook to a mush like it would do if I cooked it in the soup. But the biggest reason is that roasted cauliflower is absolutely delicious. Some low-carb recipes use cauliflower as just a filler, as a replacement for a starch, but when it’s cooked right, it is amazing! If you love Olive Garden's soups, here's a great recipe for Chicken Gnocchi Soup you will enjoy too! Chop cauliflower into bite-sized pieces then toss with olive oil, salt, pepper and garlic powder. Roast cauliflower on a very large baking sheet (or two 13x9 pans) at 375 degrees for 25-35 minutes or until toasty brown on the bottom. Keep an eye on it because the bottom will brown waaaaay before the top has any color at all. Remove from oven; set aside. This is just like traditional Zuppa Toscana minus the potatoes. If you’d like to make it the traditional way, omit the cauliflower and add 5-6 small potatoes (unpeeled, sliced ¼-inch thick) when adding the chicken broth then cook until tender (if not tender after 20 minutes). LOVE this post! One: I have been wanting to try substituting cauliflower for potatoes in Zuppa Toscana. You just took the guess work out of it. Thank you! It looks delicious. Two: I feel the same about food photography. I can't tell you how much I dislike the process. Sometimes I just eat then I have to do it all over again. I am glad I am not alone on this one. Have a great day! I love receiving your emails, I love this blog. The only thing that would make it perfect for me, and maybe I missed it, would be to see the Nutritional Information that includes Total Cholesterol amounts. Can't wait to try this recipe! I'm a total soup lover and with the cold setting in this is a great "tummy" warmer with some nice crusty bread. wow!! Sounds wonderful! Im putting cauliflower AND potatoes in my next pot!! Thanks for this recipe... I will try anything low carb. Hope you'll share more low carb recipes! I am on an ultra low carb diet called the Carb Night Solution. (It restrictions me to 30 grams of net carbs (carbs - fiber) per day, no alcohol. And one dinner a week i am REQUIRED to do carb overload with 1 glass of wine). I have lost 13#, with 10# of that being FAT, since September 1 2015. Two 3/4 cup servings of this soup was 12 NET carbs only a third of my goal. Oh the soup was wonderful. My only adjustment was a VERY light sprinkle of cayenne at the end. I used really good hot Italian sausage. I'd love to have a link, or a good search term that would allow me to pull up all your "low carb" recipes. And a very small nit, I would love to know how many servings for the 10-12 people it makes, i got 9 3/4cup ladles for HALF the recipe. A tinier nit - I assumed the onion was roughly chopped.Same for the kale. (I used Tuscan kale given the name of the dish). YUMMMMMM! I made this soup and I'm eating it right now! It is excellent! Thank you! I've been making this with Cauliflower for over two years now - love it. I do not roast the cauliflower and never had it turn to mush. I use a mandolin to slice the cauliflower and I make sure to also use the stem. YUM! Since you have already cooked the meat - you only need to boil long enough to get the cauliflower tender, turn off the heat and add the kale and cream. Stir stir stir and enjoy. But I may need to try roasting the cauliflower since that will add some depth of flavor. Does this freeze well with the cream in it? Yes it does freeze well with the cream. Just beware....this will sour if left out to cool too long. Cool just enough to handle it and refrigerate for a few hours before freezing. I love food photography! I am a food picture poster! This looks amazing! 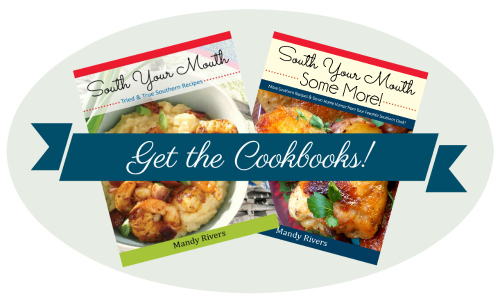 Do you have a section for Low Carb recipes? I could not find it but maybe I did not look in the right place! I have been to one of Christy's LC cooking classes and am really hooked on this WOE! This recipe looks great! Looks delicious! Could you omit the heavy cream so it's more of a broth based soup? I need to avoid dairy. Absolutely you can make this without the cream. It is very good that way. We have made it several times this way too and it’s just as delicious! I made this soup tonight, though I had spinach on hand and used that instead of kale. Let me tell you, this is the best thing I've cooked all week. Holy BEGEEBUS was it good! I have been making this soup for many many years and love it! Although I have been making it with potatoes, my sis-in-law and I are both on carb diets and when I recently made this for family Friday, I made theirs with potatoes and ours with cauliflower. It was so similar in taste we couldn’t believe it and we absolutely loved it! I forgot to mention.....I haven’t tried this yet but I believe turnips would also be a great substitute for the potatoes or cauliflower. They are close in nutritional carbs and I think taste more like potatoes than cauliflower. I made this today.. I actually used spinach instead of kale and cooked in slow cooker for 3 hrs. It was absolutely delicious! Just made this for a little dinner party. Soooooo good! It has amazing flavor!Thanks for the recipe! Forget cauliflower use daikon radish. Way better! That looks FANTASTIC! I will try it next week!